How was IBS treated in the past? Medical science has shown two main treatments to be clinically effective – elimination diets and various medication, however, both are problematic: medication treatments have shown poor effectiveness at reducing symptoms (with side-effects) and elimination diets are difficult and have poor adherence over the long-run. Many IBS sufferers have therefore resorted to a plethora of alternatives – such as peppermint oil – to alleviate their symptoms, but often to no avail. Finding themselves on a merry-go-round of ineffective treatments, searching for something that works. Researchers at Monash University recently turned to hypnotherapy treatment as an exciting alternative. The logic was that by calming and re-programming the mind, the subconscious basis of IBS could be overcome, and food digested without symptoms. In the Monash study, this ‘gut-directed hypnotherapy’ was compared against the ‘gold standard’ Low-FODMAP diet and the results were astonishing: gut-directed hypnotherapy performed just as well as the diet. Both treatment arms reduced bloating, constipation, abdominal pain by 80% and gut-directed hypnotherapy was proven as a highly effective IBS treatment. Gut-directed hypnotherapy is a godsend for the millions of sufferers of IBS. Finally, there is a way to reduce the maddening symptoms of IBS – the bloating, the constipation, the abdominal pain – whilst maintaining the diet of their choosing. No longer were they confronted with the infuriating choice between sacrificing their favourite foods or suffering pain. There was a scientifically proven and easy IBS treatment requiring no medication or change in diet. How can I access Gut-directed hypnotherapy? Gut-directed hypnotherapy is growing rapidly in popularity because of its effectiveness, safety and convenience, and many of the largest clinical centres including Manchester have a 6-12 month waiting period. Fortunately, many of the top hypnotherapists are using technology to broadcast premier gut-directed hypnotherapy audio recordings to IBS sufferers directly through iPhone applications such as Mindset. Can my iPhone treat my IBS? Gut-directed hypnotherapy iPhone apps deliver 6-8 week hypnotherapy programs which have been shown to be no less effective than in-person hypnotherapy sessions at reducing bloating, abdominal pain and constipation. These apps are accessible across the world, allowing benefits of gut-directed hypnotherapy to be accessible for people who can't wait for or afford in-person treatment. By listening to seven 15-minute hypnosis recordings each week, you can expect an 80% reduction in symptoms. The old thinking of dietary change to cure IBS is beginning to wane. Sufferers are realising that diet alone is not the answer. Gut-directed hypnotherapy using iPhone apps such as Mindset offer a way to end the nightmare of IBS without the dietary sacrifice. As most IBS sufferer know, the symptoms of this disorder are crippling and experienced physically as bloating, constipation, abdominal pain – they are not simply ‘in the head’ of the patient. However, IBS sufferers also recognise a correlation between stress and other mental pressure and ‘flare-ups’ of IBS –periods of exacerbated symptoms. 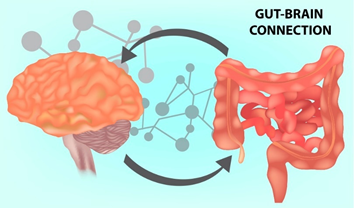 This connection is explained by the gut-brain connection,the finding that mental processes can physically affect the gut, and can be targeted to treat IBS.